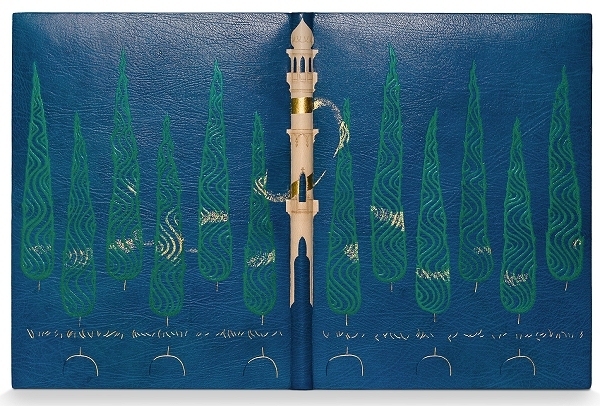 The design is based on a Persian garden of which there are beautiful glimpses in the poetry. The pottery of the period is very inspiring not only for the colours but also the shapes where trees play an important part, so six cypress trees have been placed on each board to make the number twelve for the mathematician. These trees reflect in a channel of water running horizontally across the binding and these reflections evolve into upturned glasses "--- turn down an empty Glass." The spine forms the Sultan's turret "And Lo! the Hunter of the East has caught The Sultan's Turret in a noose of Light." Our warm congratulations go to Ann for her beautiful binding. 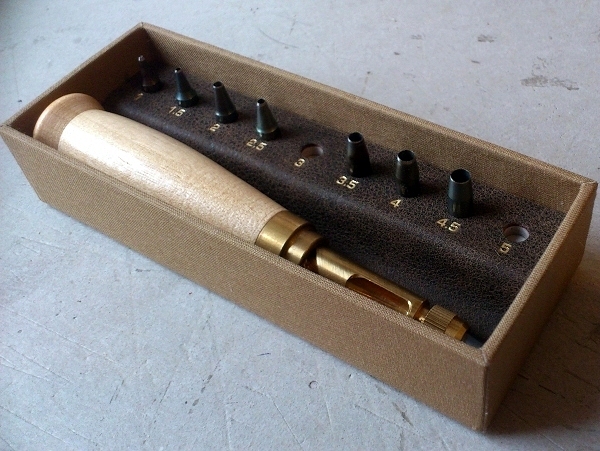 A box (designed by Benjamin Elbel) to keep your Japanese Drill Punch and its bits handy and safe. The precious tool lies on leather (because its worth it) and each bit (the whole range between 1 mm and 5 mm) has its own place with its number on it (so you don't have to wonder which is which). The tray is covered in cloth and protected by a card sleeve. Please note that the Japanese Drill Punch and Bits will need to be purchased separately!